More parties are splitting and merging, but none seem able to challenge the LDP. The co-leaders of one of Japan’s opposition parties, Japan Restoration Party (Nippon Ishin no Kai) decided to break up their alliance on Wednesday. The two leaders, current mayor of Japan’s third largest city Osaka Toru Hashimoto and former Tokyo governor Shintaro Ishihara, made the announcement at a press conference after talks at a hotel in Nagoya, according to Japan News. The split is apparently because Hashimoto wants to merge the Japan Restoration Party with another, the Unity Party (Yui no To), a move Ishihara opposes. According to the Restoration Party’s secretary-general, Yorihisa Matsuno, Ishihara proposed the split and Hashimoto agreed. As the former governor of Tokyo, Ishihara began the campaign that led the then government to purchase the disputed Senkaku/Diaoyu Islands in 2012. His international political agenda at present is closer to Prime Minister Shinzo Abe’s, as both men want to change the pacifist nature of Japan’s Constitution. 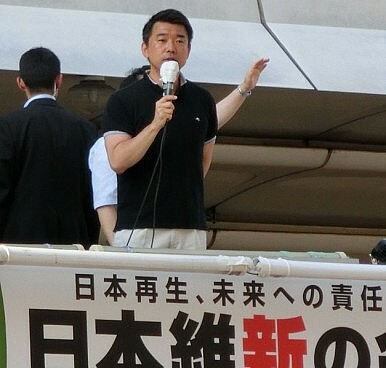 Hashimoto also inhabits the right wing, and earned infamy with his May 2013 comment that the use of “comfort women” in the Second World War was “necessary in order to maintain military discipline.” However, an alliance with the Unity Party could make his coalition Japan’s largest opposition party, at least in the lower house of the Diet. The Unity Party itself is a faction that split away from Your Party last December, and began discussions with the Restoration Party early this year about an alliance. However, Ishihara opposed the move because of their support for the constitution in its current form. Unity Party leader Kenji Eda’s policy is to amend the constitution, rather than change it, a strategy that Hashimoto has either accepted, or believes he can influence at a later date. Currently the Restoration Party has 53 members in the lower house of the Diet, and the Unity Party has nine. A merger would produce the largest opposition party in that house, larger than the Democratic Party of Japan (DPJ), which held government between 2009 and 2012 but now has just 56 seats. The ruling Liberal Democratic Party (LDP) has 295 lower house members, and with its coalition partner New Komeito has a clear mandate within the Diet. Given the LDP’s large majority, Hashimoto and Eda cannot expect to rival it at this time. However, by bringing the Restoration Party in line with a more centrist stance on Japan’s reinterpretation of the Constitution, it may be able to find more partners to ally with, at least on an issue by issue basis. This would seem to be as much as Japan’s opposition can hope for, at least for the present. A unified opposition to LDP rule has yet to solidify, and small, weak alliances will probably be the norm for the immediate future. Can Japan’s small, fractured opposition find the ability to coordinate on hot-button issues? What Yuriko Koike's Governorship Triumph in Tokyo Means for JapanAbenomics Is Failing. So Why Is Abe Poised to Win Big in Japan's Elections?Japan's 'New' Opposition Party Is Not Actually NewCan Japan's Opposition Unite to Dethrone the LDP?The Democratic Party of Japan: The Beginning of the End?